Insects are the largest and most successful group of animals on the planet. It is estimated that they comprise 80% of all animals. Around one out of every four animals is a beetle. 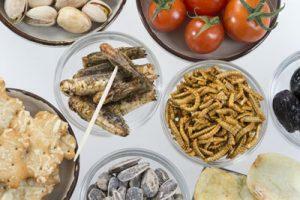 So, therefore, the nutritional value of insects varies considerably from insect to insect. The flavor and texture of each insect varies as well. This is both a new and ancient culinary experience. Although this is a recent trend in North America and Europe, around 80% of the world eats insects everyday and have been since the dawn of human existence. Our southern neighbor, Mexico, enjoys over 200 different edible insects. Thailand has over 20,000 insect farms and one of Cambodia’s top exports is edible insects. The Mopane Worm is considered a delicacy in Zimbabwe. The Witchety Grub in Australia. It’s obvious that here in the United States and Canada, we’re the ones missing out. Maybe insects are what’s missing from our North American diets?! 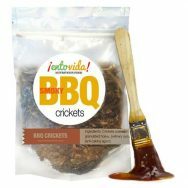 Insects are packed full of protein, beneficial fats, vitamins, minerals, and prebiotic fiber. They are animals we eat whole and are more easily digested than livestock muscle tissue. One of the challenges and also benefits of raising insects is that they are what they eat in a significant way. Feed crickets carrots and they will be high in vitamin A. We can work with and control their diets to obtain an optimal product. 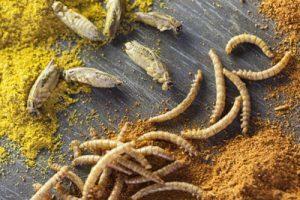 Insects are the new frontier in nutrition. We know enough to begin but there is still so much more to discover. Let’s look at these factors. Insects offer a complete animal protein that includes all 9 essential amino acids. As you can see from the chart below, insects have a wide but strong range of values and are very competitive with other protein sources. It should be noted that the insect protein data here does not take in to account variations in insect diets. 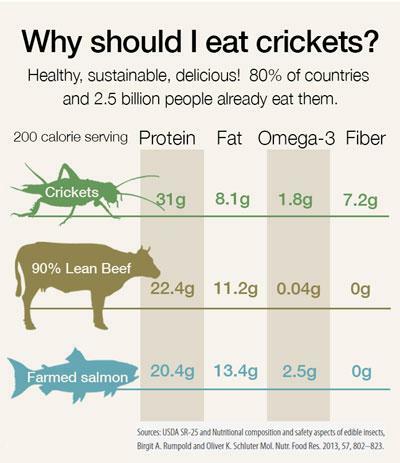 Many farms are now producing crickets and mealworms with higher protein values than what you see on this chart. Edible insects are a good source of good unsaturated fats. Essential fatty acids cannot be synthesized by the human body and must be obtained through diet. Insect are a great way to deliver these healthy fats. Crickets, as an example, have a perfect Omega 3:6 balance. Speaking of insects in general is tough because every insect vitamin and mineral content varies by type and diet. However, the one thing that is consistent is that they are a great resource for many hard to obtain vitamins. The body can absorb these vitamins and minerals at a rate that is higher than beef or wheat. 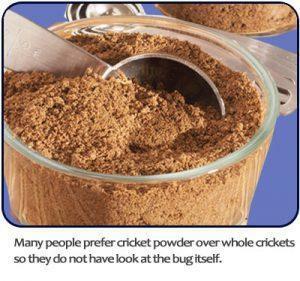 As an example, we will look at the cricket raised on a high protein grain diet. They are packed with B vitamins including being high in B12. In fact, crickets offer almost ten times the amount of B12 when compared to salmon. They are also a good source of the biologically active form of vitamin A and Riboflavin (also known as B2). When it comes to minerals, edible crickets pack almost five times as much magnesium as beef and three times as much iron. They supply more calcium than milk and they are high in zinc. Chitin is the exoskeleton of an insect and it has valuable properties in it’s own right. Chitin is prebiotic fiber that is basically nutrients for probiotic gut bacteria. 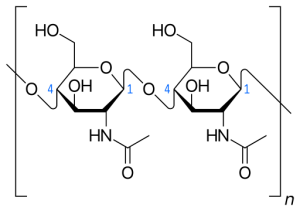 A lot of research is currently being done on chitin’s potential benefits. On top of the amount of protein, fats, vitamins and minerals provided, insects are more digestible than other protein sources. Your body can absorb more of what is available. When we eat other animals we leave out the heart, liver and other internal organs. Generally, we only eat the muscle tissue. 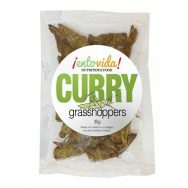 With edible insects, we eat the whole animal and this adds a myriad of other nutritional benefits. Edible insects can be grown at home just about anywhere in the world. They can be grown on small farms and by large industrial firms. This makes them one powerful answer to food security problems. 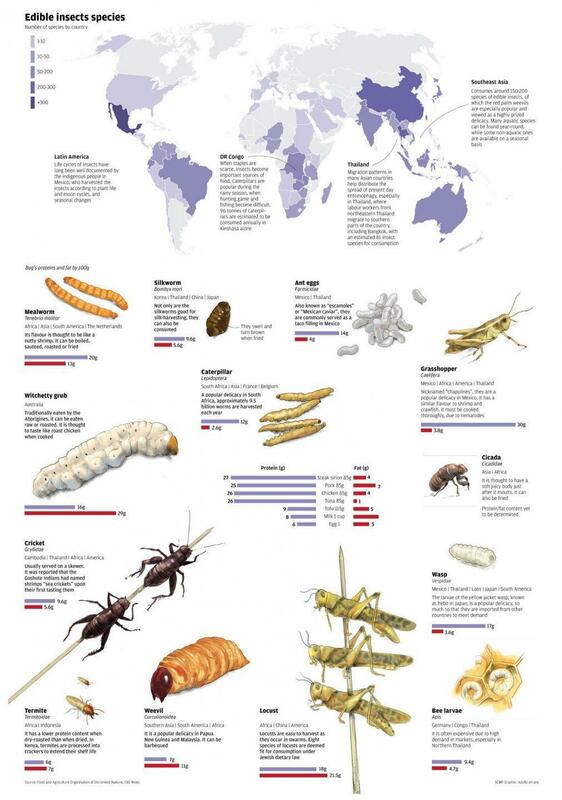 This infographic was developed by the South China Morning Post based upon the FAO’s 2013 report on food security and the use of insects as one solution.